The Cleveland Browns set the standard by which all professional football teams were measured in the 1940s and ’50s, but when they won the National Football League championship in 1964 it came as a surprise. Sports Illustrated called it “one of the biggest of all football upsets.” Redemption in ’64 tells the story of these 1964 NFL champion Browns, focusing on four individuals who were redeemed by the team’s 27–0 win over the Baltimore Colts: owner Art Modell, head coach Blanton Collier, superstar running back Jim Brown, and quarterback Frank Ryan. Following the 1962 season, Modell fired Paul Brown, the team’s first and (then) only head coach and the man for whom the team was named. Modell was an outsider, a New York ad man, and the move elicited much criticism. The team’s turnaround in 1963—it improved from seven wins to 10 under Collier—and the 1964 championship proved Modell right. Collier, a longtime assistant of Paul Brown, helped build the Browns into professional football’s premier franchise. The Kentucky native left the club in 1954 for his dream job, head coach of the University of Kentucky Wildcats, but he was fired following the 1961 season. He returned to Cleveland and was Modell’s surprise choice to replace Brown. Collier led Cleveland to the NFL title in just his second year as head coach. Jim Brown had established himself as the greatest running back in NFL history, but Cleveland hadn’t won a championship in his seven years with the team. Frustrated with playing in Paul Brown’s system, he criticized the coach publicly. Many believed the rebellious running back was to blame for Paul Brown’s dismissal. Frank Ryan was a second-string quarterback for the first six years of his NFL career. He was a backup even while playing at Rice Institute where he was pursuing a doctorate in mathematics. In 1963 and ’64, however, he blossomed into a first-stringer and a championship quarterback—one of only two in Cleveland Browns history, along with Otto Graham. 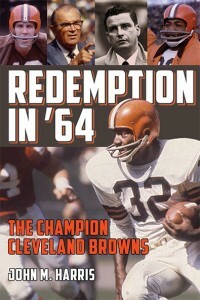 Redemption in ’64 entertains readers with the growing excitement of the Browns’ turnaround seasons. It concludes with play-by-play action of Cleveland’s thrilling victory over Johnny Unitas’s Baltimore Colts in the 1964 NFL championship contest, still one of the greatest professional football upsets of all time. AuthorJohn M. Harris grew up in Coshocton, Ohio, and watched the Browns win the 1964 championship on television in his grandparents’ basement. He lives in Bellingham, Washington, and is an associate professor of journalism at Western Washington University.